Throughout the Great Recession, only one type of household debt grew: student debt. In April 2012, student debt surpassed the $1 trillion mark, and now students owe on average nearly $27,000 by the time they graduate. As student debt and student loan defaults escalate at an unsustainable pace, private student loan lenders continue to increase their profit margins. Sallie Mae is the largest private student loan lender and one of the chief profiteers off of student debt, yet it faces minimal public scrutiny and accountability. Right now, the economy only works for the wealthiest one percent of Americans. Corporations are bringing in record profits despite record high unemployment, and now students are taking out mortgage-sized loans just to get an education. Now, students and graduates are fighting back to put education into the hands of consumers, not wealthy corporate lenders. Our vision is to re-frame the student debt crisis from a burden shouldered solely by individuals and families to one that will take higher education out of the hands of private corporations and put it back in the hands of the public and our government. 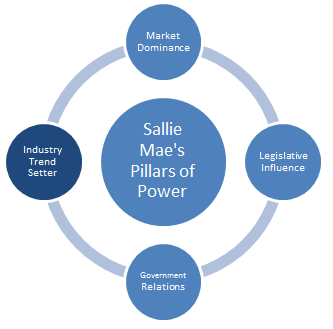 As the largest private profiteer of student debt — owning $162.5 billion of student debt and operating on over 1,000 college campuses — Sallie Mae has the power to set industry-wide trends for student loan interest rates, workers pay in call centers, and university lending practices. A publicly traded corporation, Sallie Mae is only accountable to its shareholders – not the government or students. By targeting Sallie Mae’s relationships, working to remove them from college campuses, and ensure students have a real say in their federal contracts with the Department of Education, we are aiming to minimize their dominance in higher education lending and create stronger regulations in this industry. From 2008 to 2012, Sallie Mae spent $16 million lobbying the federal government and joined organizations like the American Legislative Exchange Council (ALEC), which pushes anti-public education legislation in every state. To counter this influence, we’ll push for proactive legislation that would make higher education affordable and accessible, and to target the bad policies that have left students trapped in a never ending cycle of debt. The student loan crisis continues to present a real, imminent threat to the economy. In 2012, Sallie Mae’s senior management team, composed of five executives, made more than $20 million off of the backs of students. By challenging that corporate power, we can change the narrative around student debt to target the wealthy executives who profit off it, not the students suffering defaults because of predatory loans and crippling interest rates. By bringing together various constituencies –youth and their grandparents, business owners and unions — we can develop a movement against Sallie Mae that captures the depth and breadth of its negative influence on the economy. This entry was posted on Friday, May 17th, 2013 at 4:27 pm. It is filed under Uncategorized. You can follow any responses to this entry through the RSS 2.0 feed. What can I do to stop Sallie Mae? They’ve threatened me and my future and I want to help do what I can to stop these thieves. They don’t help anyone with loans, instead they just bully people who in this time and economy and dealing with hardships that they never thought they would encounter. Please let me know of anything that can be done.. These guys are the biggest crooks! Charging ridiculous interest rates to those of us who couldn’t get loans other places. They actually lie on the phone reporting next months payment as part of a past due amount! No one should ever get a loan through them! I wish I had looked harder for another source!!! !